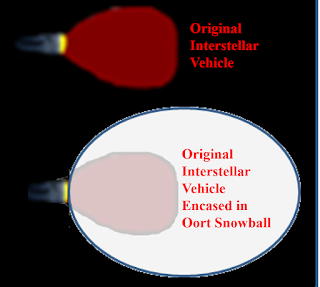 Oort Cloud (OC) is a huge, spherical body of comets orbiting Sol from 0.3 light-year (LY) to beyond an entire LY. It is the most likely source of most long-period comets. For more on Oort Cloud. As a natural border of Sol's system, Oort Cloud contains "trillions of comets" which could be harvested to benefit humankind. It is a fair distance from Earth and Sol, human's current environment. 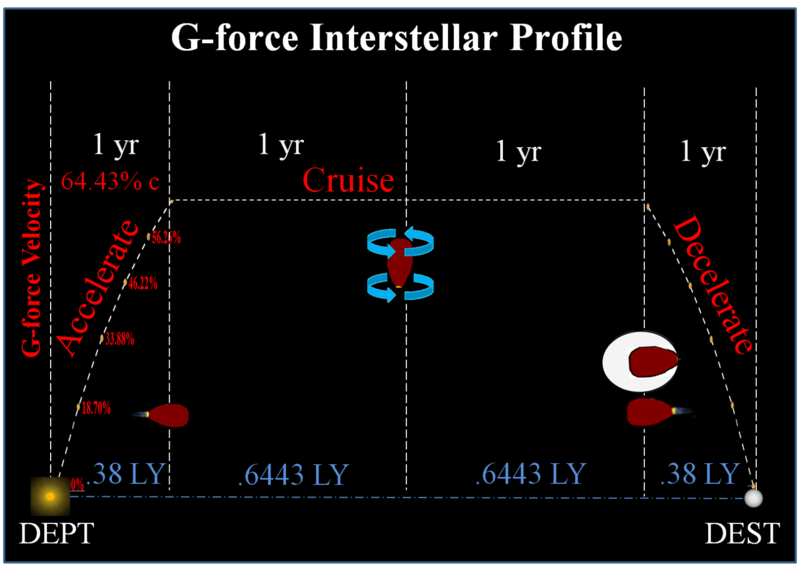 At 1 LY (63,241 AU), it will take a typical g-force spaceship profile over two years to travel from Earth. Once there, Sol’s gravity still controls the orbit, but the extreme distance will cause Sol to appear as one of a myriad of stars. Mostly empty space to accommodate human habitation. Fuel stored between inner and outer hulls. 7-G Acceleration Assume: Embedded Infrastructure. a. System of robots/nanobots to process heterogeneous mix of water, methane, ammonia, etc. b. Self contained propulsion system can turn of/off as required to eventually match speed of target, the 1G pax vessel. Assume: Resupply Vessel Starts Near Sol. While source material comes from far ranging comets, assume they are all dispatched to the Sol area for processing before starting their 100 day acceleration. A very few comets from Sol's Oort Cloud could be refashioned as "snowballs" to resupply interstellar spaceships with many metric Tonnes (mT) of ices. Fuel from water and other "ices" which can be superheated and ionized into particles. Life support from water and perhaps liquid oxygen. Building materials from "rocky" materials as well as exports from inner Solar System. To derive max benefit from resupply vessels, they should optimize their flight times with minimal waste of energy and quickest flight time. After 1 year (365 days) of 1-g acceleration, TE's interstellar vessel crew decides to stop propulsion due to fuel concerns. 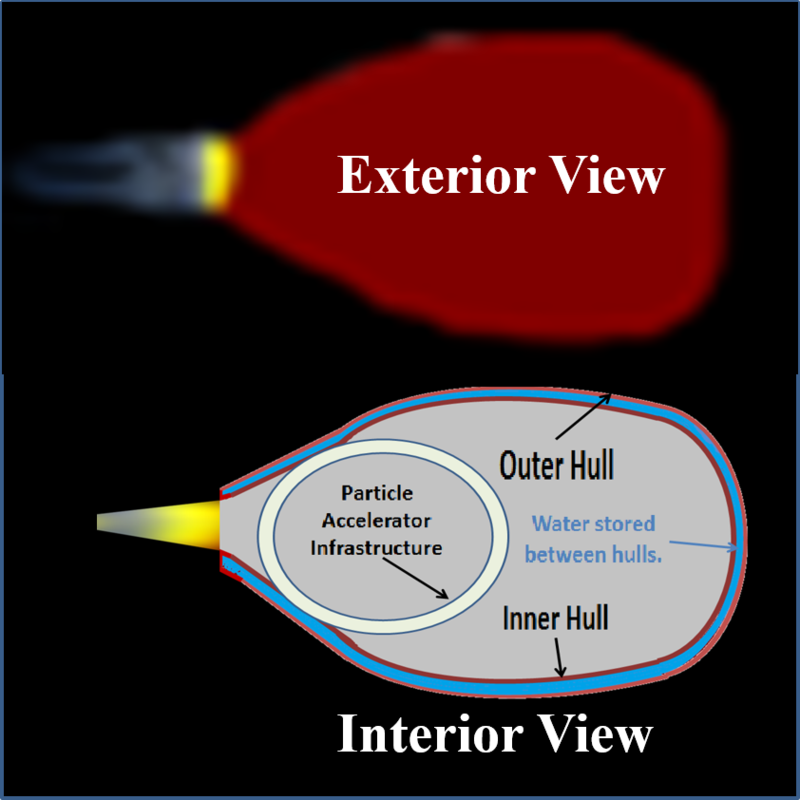 Vessel will maintain constant velocity of 64.4% light speed for several years. 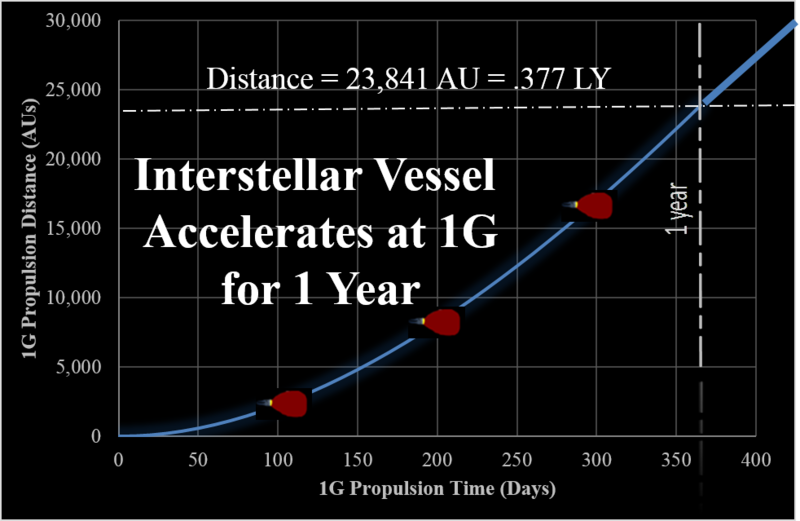 After 1-g vessel accelerates for 265.25 days, 7-g vessel initiates 100 days of 7-g acceleration. 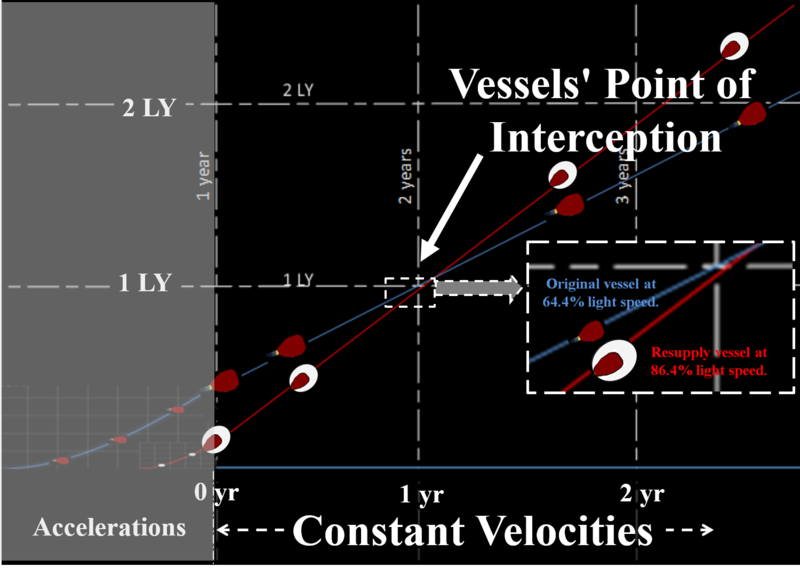 Thus, both vessels start their respective constant velocities around the time the 1-g vessel completes the one year acceleration. 7-g vessel maintains constant .866c for a certain duration. AT CONSTANT VELOCITY, vessels intercept as shown. 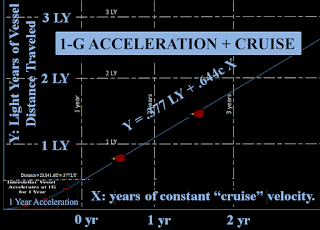 For first year, both 1-g passenger vessel and the resupply 7-g vessel go through their respective acceleration profiles as described above. Throughout 2nd year, both vessels cruise on the same path to the same destination star at their respective constant velocities. The 1-g pax vessel is .377 LY (23,841.5 AU) from Sol with velocity of .644 c (= 111.5 AU/day = 193,066 km/sec). The 7-g resupply vessel is much closer to Sol .155 LY (9,802 AU) from Sol with much greater velocity, .866 c (= 149.9 AU/day = 259,620 km/sec); thus, the resupply vessel will inevitably overtake the pax vessel. For the two vessels to rendezvous, their velocity must be equal at the point of interception; thus, the resupply vessel must decelerate prior to meeting pax vessel. Linear programming method starts with desired end point; then, work backward to determine required start point. 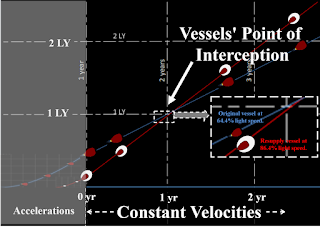 must match 1G vessel's velocity at pre-determined intercept. 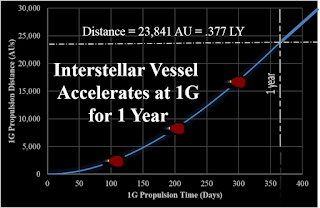 7G resupply vessel must decelerate from 149.9 AU to match 1G pax vessel's velocity (111.8 AU/day) exactly at an intercept point. Arbitrarily chose an intercept point of 2.0 years and 64,824 AU after 1G vessel launch. ⓑ 365.25 Days (remains the same). Stop 1G acceleration; start 1G cruise; velocity = 111.5 AU/day as described above. ⓒ 400 days: Resupply vessel lags pax vessel by 11,982 AU. 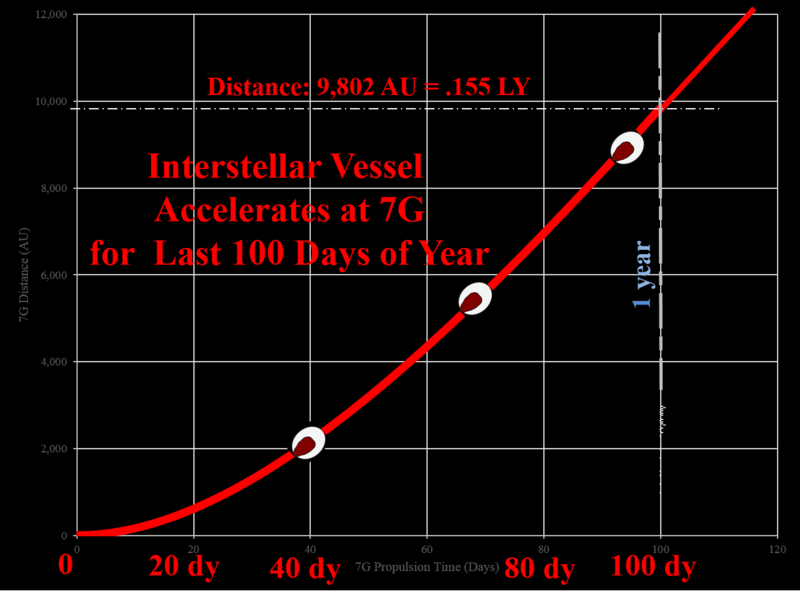 ⓓ 500 days: Due to much greater speed, resupply vessel shortens the lag to 8,142 AU. ⓔ 600 days: The lag is further shortened to 4,302 AU. ⓕ 684 days: When resupply vessel reaches 1,076 AU behind the pax vessel, it prepares to decelerate. 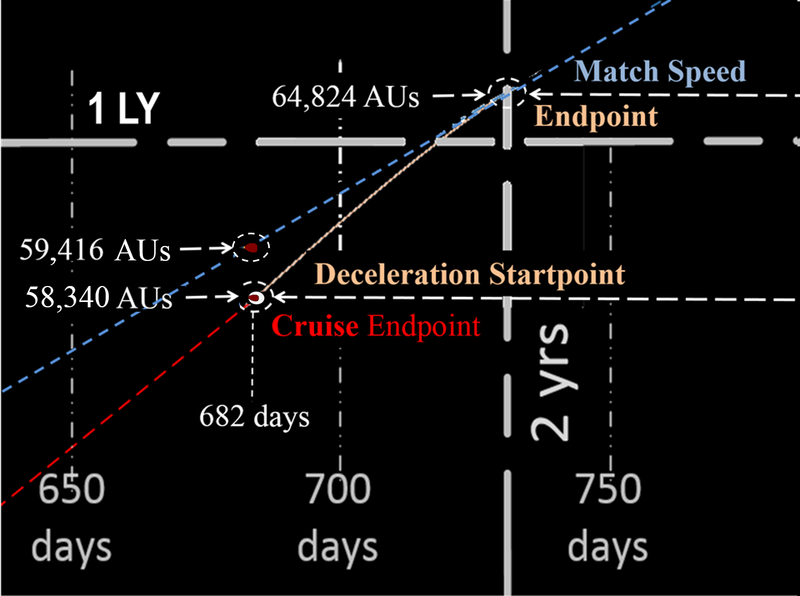 Cruise segment ends at point where deceleration starts. 7 Resupply Vessel Shifts Acceleration Period. ① t = 0.0 days. Initiate acceleration of 1-g vessel for passengers ("pax"). ② t = 260.2 days. 7G resupply vessel launches and accelerates. This 5 day adjustment proves necessary to eventually intercept the pax vessel in two years past point ①. 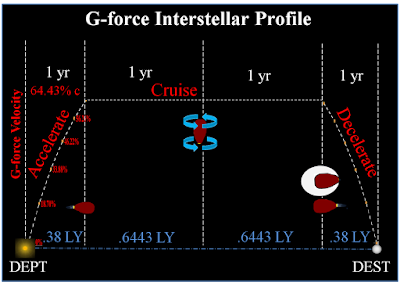 Traditional 1G Profile: Pax vessel initially accelerates at 1G for one year to attain velocity of 64.43c over a distance of .38 LY. After an indeterminate cruise duration (most likely several years), pax vessel must decelerate for same time/distance just prior to destination. Beyond 100 Days at 7G. For much faster cargo delivery, consider 7g acceleration. Assume fuel exhaust particles have velocity, VExh = 99.2%c, with a corresponding growth factor, n = 7. Thought Experiment proposes Einsteinian motions and exponential fuel consumption. 1) 100 days 7G acceleration to high speed cruise. 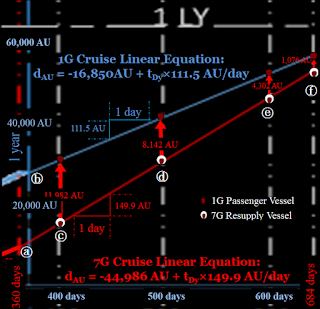 2) 48¼ days 7G deceleration to rendezvous with 1G Pax vessel. 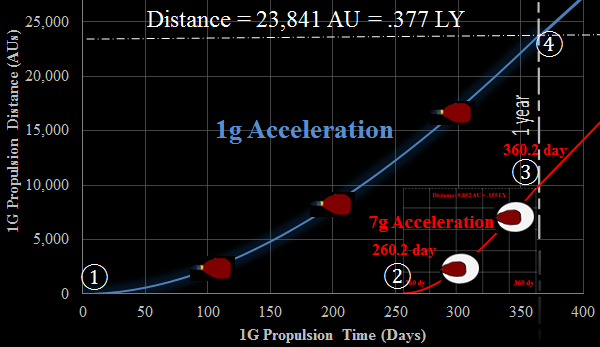 3) 365¼ days 1G deceleration in tandem with Pax vessel to orbit at destination. For more, see More Snowalls.